We try and grow as many bee friendly plants as possible, for bumblebees, our six hives of honey bees, and all the thousands of solitary bees who do 80% of all our plant pollination...blimey. Have a look at our brilliant books and links page for some bee-tastic people, places and books...and check out the photos from our Blooming Bee Friendly Day in Hayle ... just the bizness! You just can't have too much lavender.. 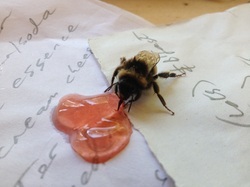 Tired bumblebee found on the kitchen floor in danger of imminent squashage...scooped up with the shopping list and given some home made rowan jelly to help recovery...just the job! Borage - feeds the bees - and us! 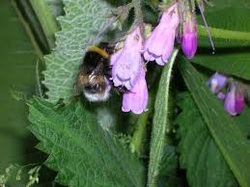 Comfrey. Feeds bees, feeds the soil, looks gorgeous - and fends off slugs. Bring it on!